Any installation of a heating appliance, or modification to a chimney such as relining, has to be carried out in accordance with Building Regulations (Part J and Part L in England and Wales and the Scottish Building Standards Agency Technical Handbook in Scotland). In England and Wales there is also a requirement that Building Control Consent is obtained for such work unless the work is carried out by a Competent Person Scheme Member. For solid fuel and wood burning appliances a Competent Person is someone who is registered with a scheme operator, such as HETAS established as such under Building Regulations Part J for that type of work. (For further details visit our general links page for HETAS and visit www.planningportal.gov.uk to view England and Wales Building Regulations). They will typically incorporate a remote control for electronic ignition and some have their own back-up power supply in the event of a mains power failure. The larger boiler models are designed for installation in kitchens or utility rooms and can be screw feed from silos outside the house. It is essential that the fuel is kept dry and the pellets must be of good quality (see section on wood fuel below). A selection of importers and retailers of wood pellet appliances will be found in the links section of this page. Building Regulations -At the moment, the installation of wood pellet burning appliances has to comply with UK Building Regulations Part J (and SBSA Technical handbook in Scotland). This means they have to conform to the conventional flue arrangements as for other wood burning and coal burning appliances, even though the manufacturers may specify less stringent requirements in their installation instructions. Most of the appliances are imported and different Building Regulations apply in their country of origin. Future revisions to UK Building Regulations and the introduction of Harmonised European Standards may reflect the differences in the combustion process between these and conventional wood burners and different flue arrangements may become possible. (Check our news page for information). If you wish to burn any type of wood fuel and you live in a smoke control area, you may only do so if you burn wood on an “exempt” appliance. An “exempt” appliance is one which is exempted to burn unauthorised fuels in smoke control areas, under Regulations published under the Clean Air Act. Certain appliances are presently exempted by DEFRA under the Clean Air Act. A list may be found here www.uksmokecontrolareas.co.uk). Wood fuel can be divided into two main categories – “Hardwood” from deciduous trees and “Softwood” from conifers or evergreens. Hardwood is denser than softwood so has a higher heat content or calorific value. Typically, the heat content of softwood is a little more than half as much as hardwood by volume. Broadly speaking, around twice as many softwood logs as hardwood logs may be required to achieve the same heat output so more frequent refueling will be necessary when burning softwood. On the other hand, softwood tends to light more easily than hardwood and burns faster due to its resin content. It gives more immediate heat so is ideal for kindling and initial burning. Ash, Beech, Birch, Blackthorn, Elm, Eucalyptus, Hawthorn, Hazel, Hornbeam, Maple, Oak, Rowan, Sycamore, Wild Cherry, Willow, Alder, Apple, Pear, Holly. Cedar, Douglas Fir, Horse Chestnut, Larch, Plane, Sweet Chestnut, Willow. In general, softwoods tend to be more prone to popping and spitting because of pockets of moisture or sap contained within the wood. The risk of spitting will be reduced by effective seasoning or drying. Important Note: never leave an open fire unattended without a fireguard! Elder –Produces a thick acrid smoke. Lime – A low quality fuel. Pine species generally (including Leylandi) – Can form oily soot deposits in a chimney. Poplar – Traditionally used for matchsticks, poor heat output but useful for kindling. 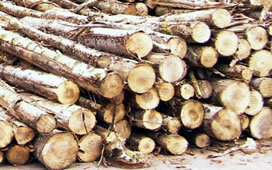 Spruce – A low quality firewood for use in closed appliances only. Recovered wood (joinery offcuts) should be clean, cut to length and not treated or painted. Chipboard, plywood and MDF should not be burnt as they contain chemical binders and adhesives which could produce toxic emissions which adversely affect the inner surface of the chimney. Please note that so-called “tanalised” timber contains arsenic. Burning unseasoned logs can result in two very serious problems associated with condensation in the chimney – blockages and chimney fires. Water vapour combines with other gases and particles going up the chimney and unless the chimney is kept warm, the condensation forms a creosote-like substance which hardens to form tar on the surface of chimney liners and may seep into brickwork in an unlined chimney. Wet logs cause the chimney to cool and so condensation occurs and a residue is formed. 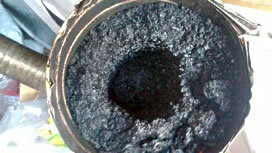 This residue is brown or black and can be flaky, sticky, runny, tar-like or hardened and will sometimes be all of these in the same flue. The chimney may become completely blocked or the volatile residue can ignite causing a dangerous chimney fire. The excessive condensation from wet wood which normally forms in the upper part of the chimney is acidic in nature and can also corrode the inner surface of a metal liner, eventually leading to perforation and failure of the liner. To avoid these problems, the SFA recommend that only well-seasoned or kiln dried firewood with low moisture content (less than 25%) should be used. Forestry work continues all year round but for the domestic heating market, trees should be felled ideally in winter and certainly before the end of March when the moisture content starts to dramatically increase. Trees felled in summer will take much longer to season. Some species of trees felled in winter will be ready for use the following winter. The target moisture content for firewood is 20% or less (wet basis) and this is often specified by the appliance manufacturer. Firewood ready for burning should never contain more than 25% moisture. Note – Consistently low moisture content is also achieved by kiln drying. A log store of at least 1.5 m³ is recommended where a property is heated by a log burning stove so that a standard delivery of 1m³ can be accommodated when the store is still a quarter full. The store should be roofed and well ventilated on at least two sides. Proprietary wood stores are available in various sizes. Where the intention is to buy unseasoned “wet” or “green” wood, a much larger storage capacity will be required so that logs obtained one or two years previously can be properly stored for the duration of the seasoning process i.e. storage capacity for three years supply of hardwood and two years for softwood will be required. The logs should ideally be stored under cover and off the ground but open on at least two sides so that air can pass through. A sunny and windy location is ideal. The logs should ideally be no more than 10cm (4?) thick and cut to a convenient length for the stove or grate (Any logs with a diameter greater than 6” (150mm) should be split before storage). The logs will lose 10-25% of moisture a year in this way, depending on the type of tree. Some of the hard woods such as Beech, Elm and Oak require two if not three summers to season thoroughly. Top tip -Seasoned logs will typically have bark which comes away easily, splits across the grain and will create a hollow ringing sound when two logs are knocked together rather than the dull thud of wet wood. It is very inefficient to burn inadequately seasoned logs because much of the heat produced as the wood burns will be required to drive off the moisture contained within the logs as steam. You would need to burn around three times as many unseasoned logs to achieve the same heat output as well seasoned or kiln dried logs (see illustrations).